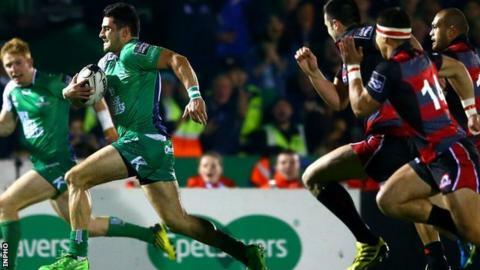 Connacht clinched a tense victory over Edinburgh at the Sportsground to stay second in the Pro12 table. A try from Tiernan O'Halloran had the hosts 8-6 ahead at the break, with Sam Hidalgo-Clyne and Blair Kinghorn kicking a penalty apiece for Edinburgh. Jack Carty landed two second-half penalties, sandwiching a 55th minute effort from Hidalgo-Clyne. Those kicks proved vital as Pat Lam's men remain hot on the heels of the table-topping Scarlets. Carty's 25-metre penalty got Connacht up and running and they provided the highlight of a finely balanced first half when full-back O'Halloran crossed in the ninth minute. From a lineout won by Aly Muldowney, Carty's inviting inside pass sent Matt Healy charging through a gap and he linked with O'Halloran on his outside for a score straight off the training ground. Carty's conversion attempt from near the right touchline came back off the post and Edinburgh were quick to respond. They pressed from a lineout maul and while they failed to make use of numbers out wide, scrum half Hidalgo-Clyne successfully slotted a penalty on the quarter hour. As half-time approached, the 18-year-old Kinghorn had the accuracy and distance to convert a long-range penalty and draw Edinburgh within two points. A strong burst from Bundee Aki led to a penalty early on the resumption which Carty sent through the uprights for 11-6. Sam Beard, one of Edinburgh's most threatening runners, led the Scots' response with a neat break and Hidalgo-Clyne clipped over his second penalty, rewarding his forwards for further pressure on the Connacht lineout. Livewire flanker Nepia Fox-Matamua got over a ruck ball straight from the restart to win a penalty which Carty converted for 14-9. Connacht won a scrum penalty which Carty drew wide from distance and he also missed a 78th minute kick after Edinburgh lock Fraser McKenzie was sin-binned for a high tackle. The 14 men launched a determined late surge from their own half but Connacht held their nerve to win a final breakdown penalty and avenge last January's 16-13 home defeat to the Scots. Connacht: O'Halloran, Leader, Aki, Ronaldson, Healy, Carty, Marmion, Buckley, McCartney, Ah You, Muldowney, Browne, Muldoon, Fox-Matamua, Masteron. Replacements: Adeolokun for O'Halloran (71), Porter for Marmion (69), Bealham for Buckley (73), Heffernan for McCartney (71), White for Ah You (49), Roux for Browne (49), E. McKeon for Masteron (62). Not Used: Parata. Edinburgh: Kinghorn, Hoyland, Dean, Beard, Helu, Burleigh, Hidalgo-Clyne, Sutherland, Cochrane, Andress, Bresler, McKenzie, Coman, Grant, Manu.